(Editor’s Note: Reminder – we do not make a practice of “advertising” specific products or companies. However, when something truly new comes to our attention, we feel an obligation to share it with our global audience. Such is the case with the following article, which introduces a new and evolutionary automation solution. Counting On Currency is pleased to present you with the story of the birth of Taxidiaâ„¢, a revolutionary automated cashâ€¨ handling banknote packaging solution from Global Cash Solutions (GCS). Every once in a while in the World of Currency a new automated cash handling solution comes along, driven by unfulfilled and/or unacknowledged demand. Every once in a while in the World of Currency an old “pain-point” gives birth to a new automated cash handling solution. Every once in a while a new automated cash handling solution becomesÂ a new niche product category for a specific processÂ that is begging for improvement. In this case, the “World of Currency” industry specific category that is both old and is now poised to be new again, is Currency Order Fulfillment. Specifically, we refer to the cash vault process of filling currency orders. 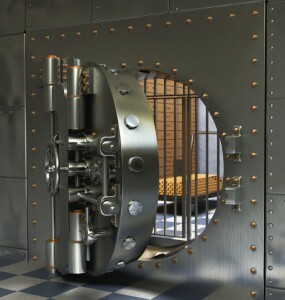 Walk into any vault and the busiest room in the entire operation is usually the Main Supply Vault, where currency orders are fulfilled to supply cash to Branches, Customers, Correspondent Banks, Central Banks and CIT’s. Not only is the order filing process impacted by time constraints and shipping limits, it is also hostage to a ready supply of verified “fit” banknotes. Over the years the front-end deposit verification process in a vault has seen productivity improvements through the introduction and evolution of automation, both in hardware and software. This is definitely not the case for the Main Supply order fulfillment process, until now. Following is a Case Study for the application of Taxidiaâ„¢ for global foreign currency supplier Travelex. It must be noted that even though the initial launch of Taxidiaâ„¢ was for foreign exchange banknote supply, Taxidiaâ„¢ can be deployed for any Main Supply operation of any size – be it single or multiple currency order fulfillment. Over the years Travelexâ€™s business has experienced a significant shift: no longer are they only producing travel money orders for consumers, but also for thousands of financial institutions, supermarkets and travel agencies. They offer these new customers end-to-end cash management solutions for foreign currency to help them increase profit, customer satisfaction and loyalty. This shift in working created a new challenge for Travelexâ€¦ their wholesale clients were placing large complicated and frequent orders including stacks of bundled banknotes and loose banknotes â€“ which were difficult to fulfil. To help overcome this challenge Travelex approached Global Cash Solutions, who worked together with Travelex to build Taxidiaâ„¢. Greek for travelling, Taxidiaâ„¢ is the only cash processor in the world that can pick and pack both single and strapped banknotes, at a high output rate, in over 80 currencies and in any denomination. Whatâ€™s more, because Taxidia is a mostly automated solution, accuracy was significantly enhanced and staff costs were reduced by up to 80%. GCS now wants to share this ground-breaking new technology with banks and CIT companies where cash centre speed, accuracy and efficiency is paramount. If you are attending the upcoming ICCOS in Milan ItalyÂ February 24th to 27th, pleaseÂ visit with GCS staff at in booth number 19. 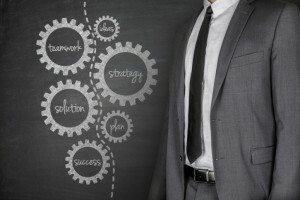 Innovative – Global Cash Solutions (GCS) have invested their resources, technology and capital to create a unique and innovative solution. Configurable -Â With its modular design, Taxidia can adapt to simple and more complex configurations using single or multi-currency banknotes, either loose or strapped. Precise -Â Taxidia significantly reduces error rates operating to Six Sigma standards. Secure -Â With manual intervention reduced to a minimum and stringent quality, integrity and audit checks, the opportunity for shrinkage is greatly reduced. Savings -Â With much reduced manual handling, staff costs are significantly reduced and can be expected to be from 50-80%. Expertise -Â Global Cash Solutions has established the genesis of a new generation of cash centre automation. Global Cash SolutionsÂ provides a number of configurable, flexible solutions – for both single-currency & multi-currency orders – to industrially automate your cash orders. Interfacing from and to the customerâ€™s system(s), e.g. import of electronic orders, and export of order results. Software to give simple instructions to operators to fill cassettes with banknotes of a certain currency/denomination. Example: Fill cassette nr. 3 of ATM nr. 1 with 2000 banknotes of EUR 10. Vision input verification system for banknotes, to avoid incorrect orders. Automated order picking & packing. Automated flexible sorting of orders on e.g. : destination, customer, Cash In Transit company or combinations. 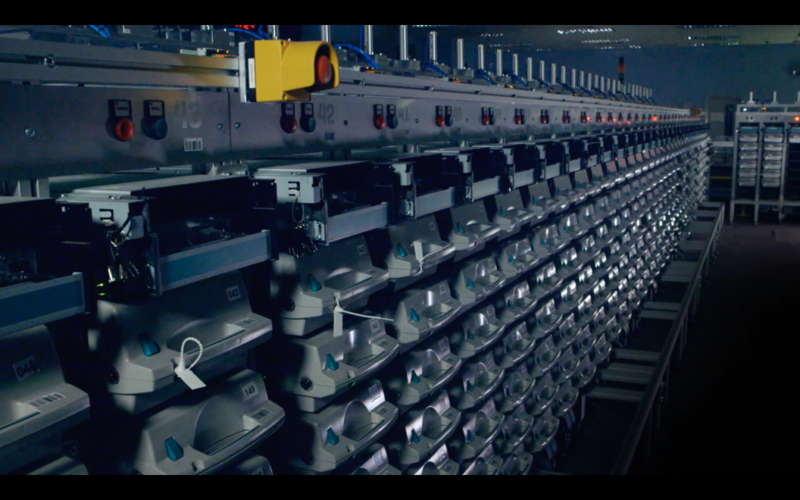 Components:Â Printers, ATMâ€™s, ATM Buffer Units, conveyor belt, packing machine, automated mailroom. How it can look like:Â see illustration on the right. Scaling up in case of increased order volumes is easy by simply adding more ATMâ€™s, ATM Buffer Units, extending the conveyor belt and perhaps adding more packing machines. Software to give simple instructions to operators to fill Column Bundle Dispensers with bundles of banknotes of a certain currency/denomination. Example: Fill Column nr. 1 with 100 bundles of banknotes (strapped) of GBP 10. 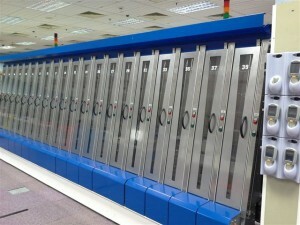 Vision input verification system for bundles of banknotes, to avoid incorrect orders. Components:Â Printers, Column Bundle Dispensers, Bundle Stacker, conveyor belt, packing machine, automated mailroom. How it can look like:Â See illustrations on the left. Scaling up in case of increased order volumes is easy by simply adding more Columns, extending the conveyor belt and perhaps adding more packing machines. Software to give simple instructions to operators to fill cassettes with banknotes of a certain currency/denomination, and to fill Column Bundle Dispensers with bundles of banknotes of a certain currency/denomination. Example: Fill cassette nr. 3 of ATM nr. 1 with 2000 banknotes of EUR 10, and Fill Column nr. 1 with 100 bundles of banknotes (strapped) of GBP 10. Vision input verification system for banknotes and bundles, to avoid incorrect orders. Components:Â Printers, ATMâ€™s, ATM Buffer Units, Column Bundle Dispensers, conveyor belt, packing machine, automated mailroom. Scaling up in case of increased order volumes is easy by simply adding more ATMâ€™s, ATM Buffer Units, Column Bundle Dispensers, extending the conveyor belt and perhaps adding more packing machines.